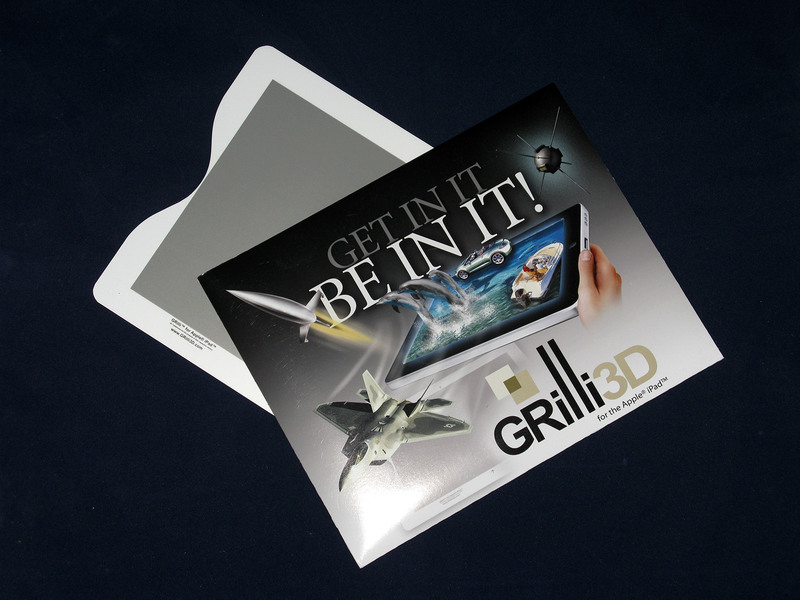 GRilli3D is a company making an interesting product called GRilli, a special film overlay in the form of something very similar to a screen protector that turns a 2D display of a normal device into a 3D-capable autostereoscopic 3D screen. Currently the GRilli is available for sale only for Apple iPad, iPhone and iPod Touch, but the way that the film overlay works can be applied to other devices as well (and versions for other devices are already in the works). The format that the 3D content needs to be stored in and displayed in order to work with the GRilli filters is stereoscopic vertical column interlace, so you can easily convert 3D photos and videos in it if you have them in Side by Side format for example. There is also a free application available on the AppStore to demonstrate how would a game work in stereo 3D mode with GRilli overlayed on an iOs device and the source code for that application is also available for developers and there is also a Unity 3D game engine plugin for using the Grilli filters. Also the CineXPlayer application for iOS-based devices has support for the Grilli 3D film overlay, so you can use this player for better quality when playing back vertical column interlaced 3D videos and you can also play Side by Side videos with it. Furthermore the CineXPlayer also supports 2D to 3D conversion of videos on iPad, so you wan take advantage of this feature as well. The installation of the GRilli overlay filter on a compatible device is very similar to putting a screen protector on your iPhone, iPod Touch or iPad, the only difference is that you need to open a special calibration image on the device in order to stick the plastic filter correctly and have the best effect. You can download some sample images and videos in the correct format for viewing from the Grilli3D website as well as the free GRilli SESCA application from the AppStore. You can get the from Amazon or from C3D Stereo. The price of the 3D film overlay is $14.99 USD for the iPod Touch and the iPhone version and $29.99 USD for the iPad version. Now, there is one very important question that you are probably going to ask about the GRilli 3D filter, due to the fact that it is not that easily removable after being applied, and that is what happens to the ability to display normal 2D content when you apply the filter on your device. The good news is that the device remains capable of pretty much normal use in 2D mode, the textual content is mildly impaired, as single pixel text may need zooming for clarity. There is also a faint “rainbow” effect, but otherwise the use of the device is not limited by the GRilli in 2D mode and you get to play some cool stereo 3D content on your mobile Apple devices without the need of wearing any kinds of 3D glasses. Of course the 3D image would be with half horizontal resolution due to the way that the filter works by creating a sort of horizontal barrier between pixels (Grilli3D calls it “Corrected and Convergent” barrier system), but since the iPod Touch, iPhone, and iPad do offer quite high resolution, especially the models with the Retina display that should not be that much of an issue. And don’t forget that due to the way that the GRilli 3D overlay filters function you are going to be able to use your device in autostereoscopic 3D mode only in a Landscape orientation and not when in portrait mode. My thought when I seen this was “this will be hard to stick on”. I take it though that the application of the film does not need to be pixel perfect or row perfect then to make it work as I imagined any variation no matter now small (more so on the retina displays) would completely ruin the effect?